Setting a new standard for aquarium filters, the New Fluval® G6 Filtration System is The Future of Filtration. The perfect convergence of beauty, brains, and brawn, Fluval® G6 redefines the filtration category by offering a unique combination of aesthetics, monitoring capabilities and performance features. No ordinary-looking filter, the G6 is a stunningly attractive, high-tech marvel that features a stylish cubic design, a glossy black finish, chrome and aluminum detailing and a backlit monitoring display. The easy-to-read backlit display is part of Fluval® Gs revolutionary Hydrotech Performance Monitor System, which is driven by an advanced microprocessor that collects critical data about your aquarium. Raising the bar in filtration performance, the G6 features a high capacity, 3-stage filtration process that includes. Mechanical Filtration featuring a pleated pre-filter cartridge that traps significantly more debris than traditional foam filter models. Chemical Filtration offering a combination of media options to make chemical filtration simpler and more efficient. Biological Filtration with Fluval® G Bio Baskets filled with new Fluval® G Nodes that accommodate billions of water-purifying nitrifying bacteria. The Hydrotech Performance Monitor System has 63 distinct screens that deliver a world of information, including water temperature, water flow, conductivity, and salinity. It automatically alerts you when any of the set parameters deviate from the optimal range. For example, the screen will flash if water temperature is too high or too low. Hydrotech also displays historical charts for different parameters, so you can address recurring issues. Another very attractive feature is the Maintenance Scheduler, which can be programmed to remind you to perform important tasks, such as changing filter media. All of the readings, historical data and reminders generated by the monitoring system are displayed in a user-friendly format. Convenient features include: AQUASTOP valves that allow you to stop the water flow and disconnect the housing quickly and easily; a Primer Button that starts water flow promptly without manual siphoning when the system is being set up or restarted; a Telescopic Intake Tube that ensures optimal water flow to the filter and Dual Output Spray Bars that help ensure maximum water dispersal. 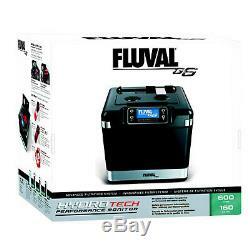 Fluval® G6 also allows extended contact time to clean water more effectively. All filter media can be changed promptly with little or no mess and no disruption. Pre-filter and chemical filter media are housed in separate cartridges and are readily accessible from the top of the filter, allowing you to remove the media without having to disassemble the filter. Other features, such as a silicon gasket, locking levers, and a double-walled construction ensure long-term reliability, durability and quiet performance. And thanks to its compact shape, Fluval® G can be housed in almost any aquarium cabinet. Fluval® G6 is designed for use in both fresh and salt water aquariums. The G6 is for aquariums up to 600 L 160 U. The item "FLUVAL G6 Advanced Filtration System, 600 L (160 U. Gal)" is in sale since Thursday, March 15, 2018. This item is in the category "Pet Supplies\Fish & Aquarium\Filters". The seller is "aquapet" and is located in Nuneaton. This item can be shipped to United Kingdom, Austria, Belgium, Bulgaria, Croatia, Cyprus, Czech republic, Denmark, Estonia, Finland, France, Germany, Greece, Hungary, Ireland, Italy, Latvia, Lithuania, Luxembourg, Malta, Netherlands, Poland, Portugal, Romania, Slovakia, Slovenia, Spain, Sweden, Australia, Canada, Brazil, Japan, New Zealand, China, Israel, Hong Kong, Norway, Indonesia, Malaysia, Mexico, Singapore, South Korea, Switzerland, Taiwan, Thailand, Chile.